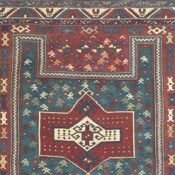 The town of Kuba, like Gendje, was a collection point for rugs from the eponymous mountainous region, due to its location on the Baku-Daghestan road. 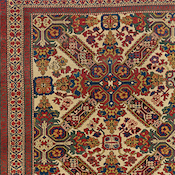 “Rugs from the … Kuba region have intricate designs. 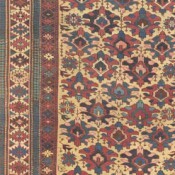 They are usually finely knotted, with a closely clipped pile”(Middleton, Michael, Rugs & Carpets: Techniques, Traditions & Designs.  Mitchell Beazley, London, 1996, p. 57). 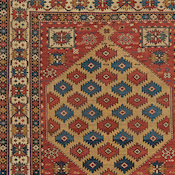 For example, this regal antique Kuba rug to the right, is a stunning, highly collectible example of 19th-century Caucasian rugs. 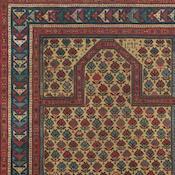 Having been in the possession of connoisseurs from the vast majority of its life, it is heavy pile condition with intact braided fringe ends, A symphony of virtuoso gemstone naturally dyed colors illumines the hand crafted antique rug’s elaborately faceted palmette motif, including emerald green, sapphire, fuchsia and carnelian red and is certain to draw the apt attention of the discriminating Persian rug connoisseur. 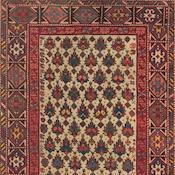 It’s series of exquisitely woven borders further elevates its grandeur while many tiny totemic motifs add liveliness in the background. 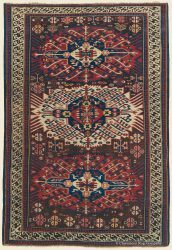 “Rugs from the Kuba area are as highly thought of by collectors as those from the Kazak region and have considerably higher knot counts. 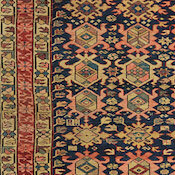 Cotton is frequently used in the foundations and may also appear in the selvedge, which is often dyed pale blue. The pile is clipped very short. 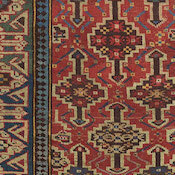 ” (Middleton, Michael, Rugs & Carpets: Techniques, Traditions & Designs. Mitchell Beazley, London, 1996, p. 56).